At Wellness®, health is always part of the equation. That’s why we created these crunchy, perfectly-sized treats as a complement to our Just for Puppy recipes. Each irresistible little real-food bite is made from a unique blend of healthy ingredients like lamb, salmon, carrots, blueberries and flaxseed. That’s the Wellness Way to give your little friend everything they need to grow up smart, strong and well-behaved. Happy Training! 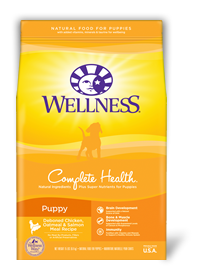 At Wellness®, health is always part of the equation, especially during puppyhood. Our grain free Puppy Bites treats are available in both soft and crunchy textures. 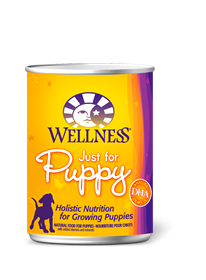 The treats provide a natural source of DHA (Docosahexaenoic Acid), a natural omega-3 fatty acid essential in the development of a puppy’s brain and nervous system. With wholesome ingredients such as lamb, salmon and apples, Puppy Bites are perfect for training and treating your growing dog. Deboned Chicken, Peas, Chickpeas, Tapioca Flour, Cane Molasses, Carrots,Flaxseed, Chicken Meal, Chicken Fat (preserved with Mixed Tocopherols), Salmon Oil,Natural Flavor, Spinach, Vitamin A Supplement, Vitamin E Supplement, MixedTocopherols added to preserve freshness, Broccoli, Cranberries, Apples, Blueberries,Dehydrated Alfalfa Meal, Sweet Potatoes, Bananas, Dried Kelp, Rosemary Extract,Green Tea Extract, Spearmint Extract. 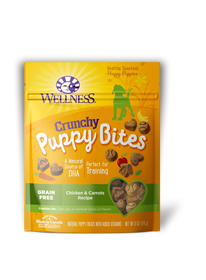 Just for Puppy treats are intended for intermittent or supplemental feeding only. Calorie Content (Calculated): This product contains 3,580 kcal/kg or 3 kcal/treat ME(metabolizable energy) on an as fed basis.